When designing the main image for a product that consists of multiple pieces, it’s critical to think about how the component parts are arranged. 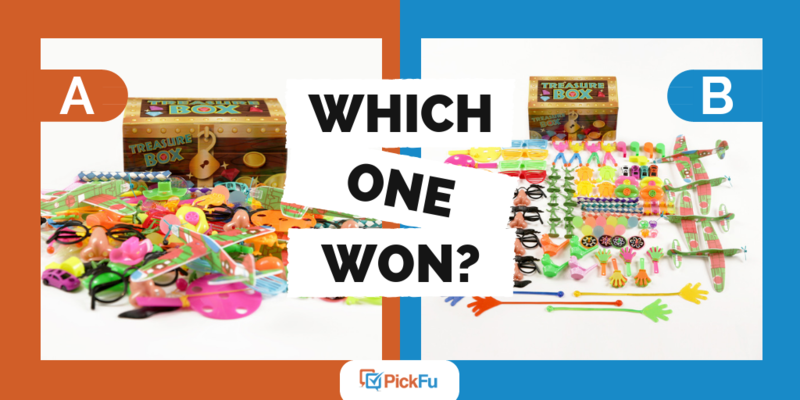 In a recent PickFu poll, one Amazon seller split tested two main product images for Treasure Box toy set. The seller received responses from 50 members of the general population in 26 minutes. In Option A, the toys form a clump in front of the box, playing off the visual we associate with a treasure chest: a pile of gold, silver, and jewels straight out of a tale of swashbuckling pirates on the high seas. Option B shows the toys neatly organized in front of the box, with like items displayed together. And the winner is… Option B! Option B won by a landslide, receiving 44 out of 50 votes. These results were consistent among the majority of test panel participants, regardless of age or gender. The majority of participants preferred Option B for its organization. When toys are heaped in a pile, they’re less aesthetically pleasing than when they’re neatly arranged. Although it’s unlikely that anyone would discover a real hoard of treasure arranged in such an orderly fashion, when it comes to a chest of toys, customers prefer an organized view. Respondents chose Option B for two key reasons: organization is aesthetically pleasing and makes it crystal clear what they would get for their money. Even though Option A’s treasure pile is a fun idea, organization wins out in the end. Not sure how to lay out the components in your product’s featured image? Try an Amazon split test by creating a PickFu poll — it’s fast, easy, and could help your listing’s performance.